شجاع الدینی, سید وهاب, کسب گر حقیقی, رسول. (1394). روشی جدید به منظور آشکارسازی عیوب در تصاویر اخذ شده از روکش چوب: بهینه سازی تابع انرژی روی تصویر حاصل از حذف طرح و نقش طبیعی. 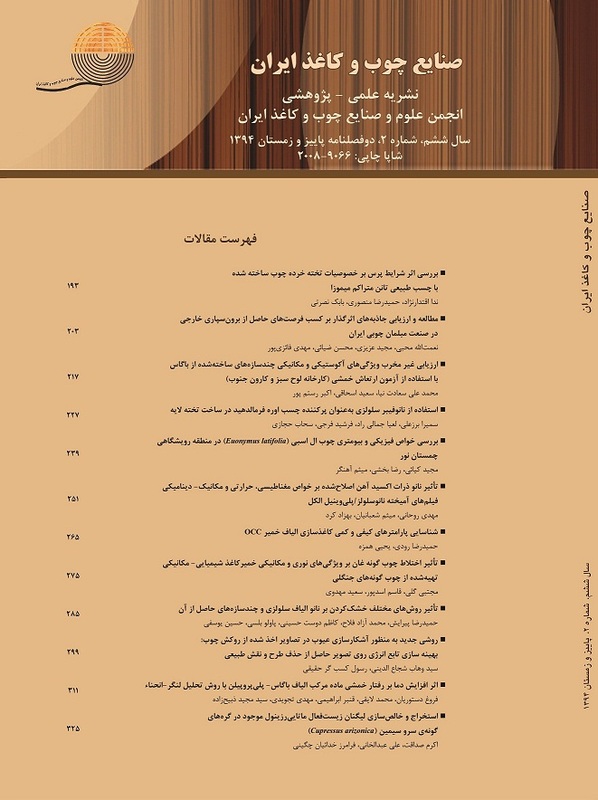 مجله صنایع چوب و کاغذ ایران, 6(2), 299-309. سید وهاب شجاع الدینی; رسول کسب گر حقیقی. "روشی جدید به منظور آشکارسازی عیوب در تصاویر اخذ شده از روکش چوب: بهینه سازی تابع انرژی روی تصویر حاصل از حذف طرح و نقش طبیعی". مجله صنایع چوب و کاغذ ایران, 6, 2, 1394, 299-309. شجاع الدینی, سید وهاب, کسب گر حقیقی, رسول. (1394). 'روشی جدید به منظور آشکارسازی عیوب در تصاویر اخذ شده از روکش چوب: بهینه سازی تابع انرژی روی تصویر حاصل از حذف طرح و نقش طبیعی', مجله صنایع چوب و کاغذ ایران, 6(2), pp. 299-309. شجاع الدینی, سید وهاب, کسب گر حقیقی, رسول. روشی جدید به منظور آشکارسازی عیوب در تصاویر اخذ شده از روکش چوب: بهینه سازی تابع انرژی روی تصویر حاصل از حذف طرح و نقش طبیعی. مجله صنایع چوب و کاغذ ایران, 1394; 6(2): 299-309. در این مقاله یک روش جدید برای آشکارسازی عیوب سطح چوب به منظور تعیین کیفیت آن ارائه می گردد. در این روش ابتدا تفکیک عیوب از پس زمینه طبیعی روکش چوب در قالب یک مساله آزمون فرض های تصادفی مدل می شود. در گام بعدی طرح و نقش طبیعی روکش چوب با استفاده از مفهوم ریخت شناسی حذف می گردد. سرانجام مرزهای صحیح عیوب به کمک بهینه سازی تابع انرژی بر روی تصویر همگن شده فوق، استخراج می گردند. عملکرد روش پیشنهادی با آزمودن آن بر روی تصاویر واقعی که شامل عیوب سطحی مختلفی هستند، ارزیابی می شود. نتایج حاصله نشان می دهند که روش پیشنهادی عیوب را حدوداً 18 درصد بهتر از روش های ارائه شده دیگر آشکار می نماید. همچنین ملاحظه می شود که انجام آشکارسازی بهتر در روش پیشنهادی نه تنها موجب استخراج عیوب نادرست بیشتری نمی شود، بلکه نرخ آشکارسازی غلط را نیز حدوداً 8.2 درصد در مقایسه با روش های موجود کاهش می دهد. بنابراین، می توان نتیجه گرفت که روش پیشنهادی این مقاله می تواند به عنوان یک جایگزین مناسب برای روش های فعلی در کاربرد آشکارسازی عیوب سطوح روکش چوب مورد استفاده قرار گیرد. Portala, J.F. and Ciccotelli, J., 1992. Nondestructive testing techniques applied to wood scanning. Industrial Metrology, 2(3-4):299-307. Kamariah, N., Ismail N. and Mohamad Zain J., 2009. A review of external wood defect detection. International conference on software engineering and computer systems, 19-21. Zhong, Y., 1995. Image segmentation for defect detection on veneer surfaces. A thesis submitted to Oregon State University, Includes bibliographical references, leaves 180-198. Lemaster, R.L., 2004. Development of an optical profilometer and the related advanced signal processing methods for monitoring surface quality of wood machining applications. Doctoral Thesis, Department of Wood and Paper Science, North Carolina State University, 254 p.
 Bond, B.H., 1998. Characterization of wood features using color, shape and density parameters. Dissertation, Department of Wood Science and Forest Products, Virginia Polytechnic Institute and State University. Blacksburg. Srikanteswara, S., 1997. Feature identification in wooden boards using color image segmentation. MSc Thesis, Department of Electrical and Computer Engineering, Virginia Polytechnic Institute and State University. Blacksburg. Lu, D .and Weng, Q., 2007. A survey of image classification methods and techniques for improving classification performance. International Journal of Remote Sensing, 28(5):823–870. Unsalan, C. and Erçil, A., 1998. Defect inspection of wood surfaces. Electrical and electronic engineering, Bogazici University. Funck, J.W., Zhong, Y., Butler, D.A., Brunner, C.C. and Forrer, J.B., 2003. Image segmentation algorithms applied to wood defect detection. Computers and Electronics in Agriculture, 41:157-179. Sahoo, P.K., Soltani, S. and Wong, A.K.C., 1988. A survey of thresholding techniques, Computer Vision, Graphic and Image processing, 41:233-260. Mu, H., Qi, D., Zhang, M. and Yu, L., 2008. Image edge detection of wood defects based on multifractal analysis, Proceedings of the IEEE International Conference on Automation and Logistics, 1-3 Sept., Qingdao, 1232-1237 p.
 Belknap, R., 1999. Software vision: understanding other edge and line-based segmentation techniques, Vision Systems Design, 4:25-28. Gasim., Harjoko, A.and Hartati, S., 2013. Merging feature method on RGB image and edge. International Journal of Computer Science and Information Technologies, 4(1):188 – 193. Chen, L., Wang, K., Xie, Y.H. and Wang, J.K., 2014. The segmentation of timber defects based on color and the mathematical morphology. Optik – Interntional Journal for Light and Electron Optics, 125(3):956-967. Kass, M., Witkin, A. and Terzopoulos, D., 1988. Snakes: Active contour models. International Journal of Computer Vision, 1(4):321-331. Gonzalez, R.C., Woods, R.E. and Eddins, S.L., 2003. Digital image processing using MATLAB, Pearson Prentice Hall 609 p.
 Pisupati, C., Wolff, L., Zerhouni, E. and Mitzner, W., 1996. Segmentation of 3D pulmonary trees using mathematical morphology. Mathematical morphology and its applications to image and signal processing, 5:409–416. Aykac, D., Hoffman, E.A., Mclennan, G. and Reinhardt, J.M., 2003. Segmentation and analysis of the human airway tree from three-dimensional X-ray CT images, IEEE Transactions on Medical Imaging, 22:940-950. Irving, B.J., Taylor, P. and Todd-Pokropek, A., 2009. 3D segmentation of the airway tree using a morphology based method. Presented at: Second International Workshop on Pulmonary Image Analysis, London, 297-307. Caselles, V., Kimmel, R. and Sapiro, G., 1997. Geodesic active contours. International Journal of Computer Vision, 22(1):61-79. Paragios, N.and Deriche, R., 2002. Geodesic active regions: a new framework to deal with frame partition problems in computer vision. Journal of Visual Communication and Image Representation, 13:249–268. Osher, S. and Fedkiw, R., 2003. Level set methods and dynamic implicit surfaces, Springer-Verlag New York, 273 p.
 Zhao, H.K., Chan, T., Merriman, B. and Osher, S., 1996. A variational level set approach to multiphase motion. Journal of Computational Physics, 127(1):179-195. Todoroki, C.L., Lowell, E.C. and Dykstra, D., 2010. Automated knot detection with visual post-processing of Douglas-fir veneer images. Computers and Electronics in Agriculture, 70:163–171.